He quarterbacks his club at both ends of the ice. Must be good at face offs and passing, and it doesnt hurt if hes a good shot as well. Coaches want a lot of creativity in this position and a lot of hockey smarts. The ice surface is divided into three zones. The area where the goal net is located is the defending zone for the team defending that net. The middle of the rink, between two blue lines, is the neutral zone. The area where the opposing net is located is the attacking zone or offensive zone. The puck is made of black, vulcanized rubber. A standard puck measures one inch thick and three inches in diameter, and weighs between 5.5 and 6 ounces. The puck can be moved with the hockey stick or the feet, but picking it up with the hands is illegal. A stick held by each player and used to retrieve, control, carry, pass and shoot the puck. Goals are scored by using the stick to shoot the puck into the opponents net. A shot that inadvertently deflects into the net off another players body is allowed to stand as a goal. A cage measuring four feet tall and six feet wide, strung with nylon mesh in the back. There are two nets at opposite ends of the ice, guarded by the goaltenders. 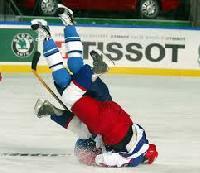 Each team has six players on the ice, one goaltender see picture and five skaters see picture. The fivehtmskaters have assigned positions three forwards and two defensemen. Regardless of assigned positions, all players except the goaltender can go anywhere on the ice. The goaltender cannot cross the center ice red line that divides the rink in half. The game is played in three 20 minute periods. The clock is stopped during all stoppages in play. A player can use a shoulder, hip or torso to hit or impede an opponent, but only when the opponent is in possession of the puck. A body check that targets the head is illegal. A body check to an opponents back is illegal if the opponent is facing the boards. Professional hockey has existed since the early 20th century. By 1902, the Western Pennsylvania Hockey League was the first to employ professionals. The league joined with teams in Michigan and Ontario to form the first fully professional leaguethe International Professional Hockey League IPHLin 1904. The WPHL and IPHL hired players from Canada; in response, Canadian leagues began to pay players who played with amateurs. The IPHL, cut off from its largest source of players, disbanded in 1907. By then, several professional hockey leagues were operating in Canada with leagues in Manitoba, Ontario and Quebec. In 1910, the National Hockey Association NHA was formed in Montreal. The NHA would further refine the rules dropping the rover position, dividing the game into three 20 minute periods and introducing minor and major penalties. After re organizing as the National Hockey League NHL in 1917, the league expanded into the United States, starting with the Boston Bruins in 1924. Professional hockey leagues developed later in Europe, since bandy was still popular, but amateur leagues leading to national championships were in place. One of the first was the Swiss National League A, founded in 1916. Today, professional leagues have been introduced in most countries of Europe. Top European leagues include the Kontinental Hockey League, the Czech Extraliga, the Finnish Liiga and the Swedish Hockey League. Ice hockey is a full contact sport and carries a high risk of injury.The players are moving at around 30 45 km h approximately 20 30 mph and quite a bit of the game revolves around the physical contact between the players. Skate blades, hockey sticks, shoulders, hips, and hockey pucks all contribute. The type of injuries associated with hockey include lacerations, concussions, contusions, ligament tears, broken bones, hyperextensions, and muscle strains.